Neo uses the same keyboard as I do! The image comes from a video I had recorded (the previous time they put it on TV), and I apologize for the low quality. In any case, you have my word that the white keyboard that appears in the movie is the kind of keyboard I use at work: one of those curved ones, with two separated key areas, one for each hand. I think some go under the name "Microsoft Natural Keyboard", and I must admit they are one of the very few things M$ got right. 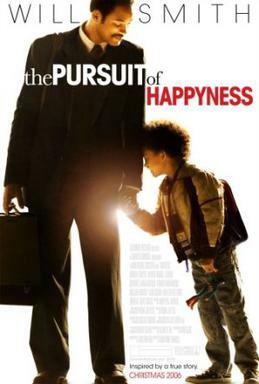 Last friday I watched "The Pursuit of Happyness" (es: "En busca de la felicidad") with a friend (IMDb|FilmAffinity). We had other plans, but had to abandon them for various reasons, and ended up in the cinema. Let me tell you it definitely was a good outcome. The movie is simply great. It has moments of joy and sorrow, and the feelings are very well portrayed. The storyline of the movie is touching, and the actors are very well in their characters. Will Smith is really far from his usual clown role (which I also like), and puts a serious tone in his impersonation of a troubled salesman, struggling to get a better life. I really recommend watching this movie. Yesterday I watched "The Prestige" ("El truco final" in Spain) (IMDb|FilmAffinity), and was rather pleased with it. I do not dare to compare it to films like Newman and Redford's The Sting ("El Golpe" in Spain), but I feel tempted to. The plot is superb, and the unraveling of the events is delicious. The best things about it, however good they are, are not the crafting of the set designs and the magical tricks. What I liked most is the psychological profile of the two main characters. The film sketches quite accurately the enmity, envy, obsession and pride of two great competing magicians. The audience is taken away from the paradigm of "good guy vs. bad guy", to an scenario of two rather "bad guys", blinded by obsession. The only weak point I'd like to point out is the fact that one of the tricks they show (and explain in the end) pictures as scientific an effect that is not, and would require actual magic to happen. But, what the heck, it is a movie, and that fake science is necessary for the dramatic development of the film, so... let it be.